"You have heard that it was said, 'An eye for an eye, and a tooth for a tooth.' But I tell you, don't stand against an evil person. If someone hits you on the right cheek, then turn and let him hit the other cheek too." Jesus' words draw us to the values of our Heavenly Father. Rather than passively accepting evil, we are to overcome evil with good. We are to work redemption in the face of mistreatment like the suffering servant in Isaiah who suffers, serves, and redeems in the face of attack and ridicule. Jesus reminds us that we are to redeem rather than to try to get even. 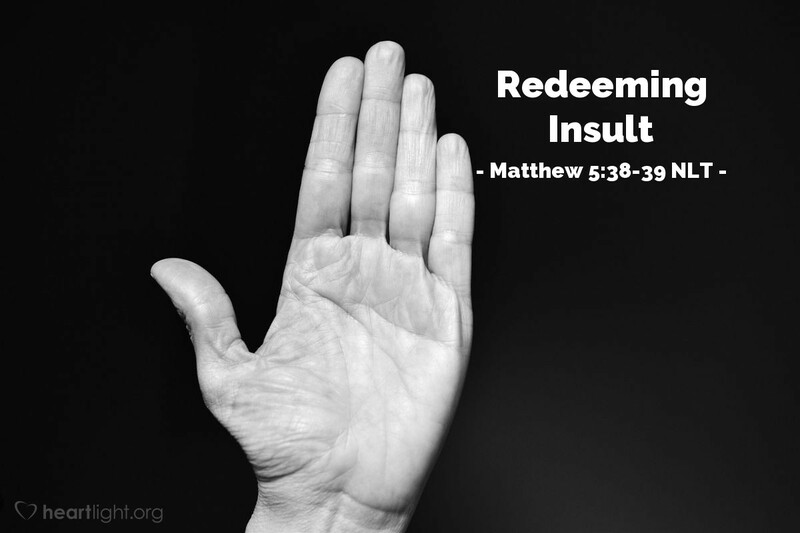 A slap on the cheek in Jesus' day was more a social insult than a physical injury. In our day, we seldom slap someone on the cheek to embarrass or humiliate that person. Instead, we shoot them a "zinger," cut them down sarcastically, or tell a joke at their expense. This is out of bounds for believers. Such talk does not accomplish the redemption God has called us to share with others. Holy and patient Father, please strengthen me so that I will look for ways to redeem those who shame and humiliate me. I know that vengeance will only poison my heart and alienate me from the insulting party. Give me grace to react with kindness even toward those who are unkind to me. In the name of the one who did not rebuke his accusers I pray. Amen.